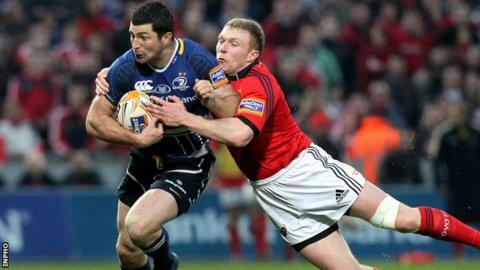 Leinster beat their Irish provincial rivals Munster in a disappointing Pro12 clash at Thomond Park. Jonathan Sexton's three penalties helped Leinster lead 9-3 at half-time with Ronan O'Gara replying for Munster as scrappy scrum exchanges affected the Limerick contest. Two O'Gara penalties levelled the game before Sexton put Leinster ahead again. A Fergus McFadden penalty and Ian Madigan's late drop goal ensured a deserved win for the visitors. Leinster almost made the perfect start as Sexton's chip over the Munster defence appeared set to be gathered by a charging Rob Kearney but the ball bounced away from the Ireland full-back. Sexton kicked Leinster ahead in the 10th minute after the Munster scrum had been penalised and the front-row exchanges became the dominant theme in a turgid first half. O'Gara missed a chance as he hit the woodwork from a penalty but then did level after Sean Cronin had been penalised. However, Sexton restored Leinster's lead and Munster prop Marcus Horan then incurred the wrath of referee Nigel Owens which handed another three points to the visiting fly-half. Repeated scrum collapses after the break saw opposing props Ross and Horan both sin-binned by the Welsh whistler. The 14-a-side format appeared to suit Munster better as O'Gara slotted two penalties to level the contest. However, Leinster regained the initiative as Isa Nacewa and Kearney both went close to crossing for a try. The pressure yielded Sexton's fourth successful penalty and replacement McFadden put further daylight between the teams with 10 minutes left. More Leinster pressure allowed replacement fly-half Madigan to slot a late drop goal which prevented the home team from picking up a losing bonus point. Munster: F Jones; J Murphy, K Earls, L Mafi, S Zebo; R O'Gara capt, T O'Leary; M Horan, D Varley, BJ Botha; D O'Callaghan,M O'Driscoll; Dave O'Callaghan, P O'Mahony, J Coughlan. Replacements: M Sherry, W du Preez, S Archer; B Holland, T O'Donnell, D Williams, I Keatley, D Barnes. Leinster: R Kearney; I Nacewa, B O'Driscoll, G D'Arcy, L Fitzgerald; J Sexton, E Reddan; H van der Merwe, S Cronin, M Ross; B Thorn, D Toner; K McLaughlin, S Jennings, J Heaslip (capt). Replacements: R Strauss, C Healy, J Hagan, L Cullen, S O'Brien, I Boss, I Madigan, F McFadden.